After dinner, one of my 6-year-old twins, J, asked what she probably expected was a straightforward question: “Are we Christians?” I assume that it was prompted by the morning’s Sunday school lesson, today’s topic having been the denial of Peter. My answer was anything but straightforward. It’s not the “Christian” part that’s complicated. It’s the “we” part. I’m atheist. My ex-husband, the girls’ father, is Catholic. We agreed to raise the girls Catholic until they were old enough to make their own decisions about what they believe. Getting divorced didn’t affect my commitment to honour his faith. Our daughters and I continued to read Bible stories, attend church, pray nightly, and talk about how to apply Biblical allegories and principals to our daily lives. The girls weren’t particularly keen on attending church until their babysitter took them to hers. The girls begged to switch from Catholic church to our babysitter‘s nondenominational Christian church, which we’ve attended since. I have been readying myself to answer J’s question for 20 years. I actually expected it to come from my sister, 10 years my junior and, like me, raised Muslim. She never asked. I was 7 when I decided that I was an atheist, so I’d been anticipated that my girls would start examining their own beliefs any day now. They’ll be 7 next month. “WHAT?” Both my daughters were shocked. “If you have no daughters, you wouldn’t pray?” J clarified. “So you’re not Jewish?” M persisted. “At bedtime and when we want to,” J answered. “Even your feet?” M asked, appalled. “Yes, washing your feet is part of it,” I told her. 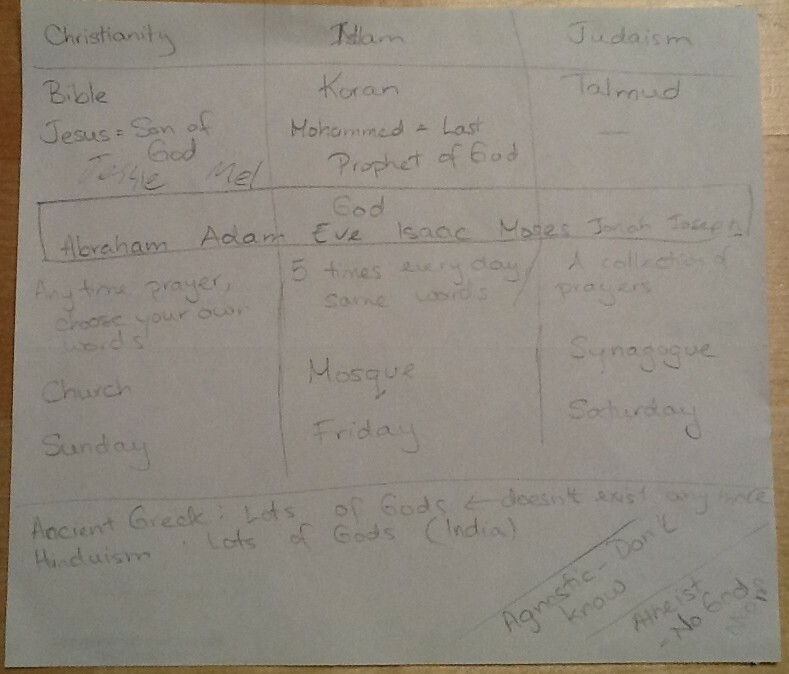 I went into a high level comparison of the major monotheistic religions, and then threw in a few polytheist beliefs for good measure. J wanted to know what I called myself. When I taught her the word “atheist,” she rolled in around on her tongue a few times, trying it out. The girls didn’t make it to bed at our targeted 8:30 pm time. At 9:00, J still had me listing all our relatives who are Christian: pretty much everyone on her Dad’s side of the family. She and M both included themselves in the list. M wasn’t quite comfortable with leaving me off the list, but J said that she thought it was important that I should be free to believe what I want. This parenting thing is complicated, and I certainly don’t make it any simpler on myself with my atheist pro-religion philosophies. Sadia is the mother of identical twins, M and J, and coordinator of the mothers of multiples blog How Do You Do It? She lives in Texas, having been in the US for the past 15 years. Her childhood was about evenly split between Bangladesh and the United Kingdom. Her ex-husband is an all-American US soldier of Mexican, Scots-Irish, and French descent. While he attended American public schools and regularly attended Catholic church in childhood, Sadia attended Catholic and secular private schools and visited mosques a handful of times.